My most-used chapter in Feast would have to be the Breakfast chapter. (See my previous post on the magnificent Andy's Fairfield Granola). It all started with the Granola. It’s delicious. It’s nutritious (I hope). Well, I know it's full of fibre! (Don't ask for proof, just trust me). And my family loves it. In fact, I’ve been home from Malaysia less than a month, and I’ve already made it three times! (And the chocolate variation three times as well). 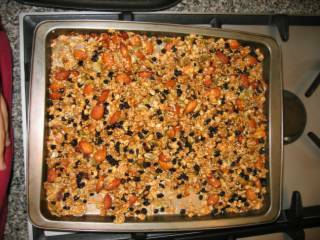 I’ve also done the chocolate and peanut variation of the granola, which is just as, if not more, delicious. My dad prefers this one because he loves peanuts. In the recipe, Nigella says that she never puts raisins in the chocolate version, but I chose to ignore that suggestion. Chocolate, peanuts and raisins are a match made in heaven. (And anyone who’s ever had the chocolate fruit & nut cookies from Ben’s Cookies will know exactly what I’m talking about). 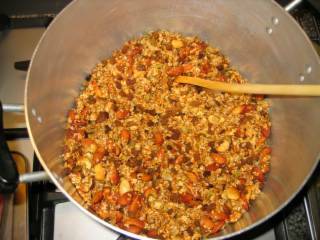 Another recipe in the Breakfast chapter is the wonderful Muesli, which, whilst not as immediately addictive as the granolas, is now absolutely necessary in my kitchen to be a light alternative to the granolas, and as a delicious cereal in its own right. Various Nigella cereals on Kitchen Bench. 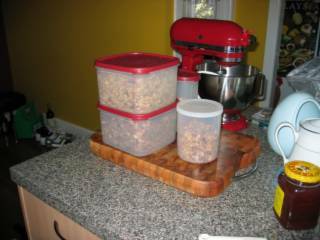 In the above picture, the regular granola is on top, the chocolate granola is on the bottom, there is regular granola without raisins in the smaller container, and muesli behind the other cereals. You can’t really see it, but don’t worry, it doesn't look that exciting. 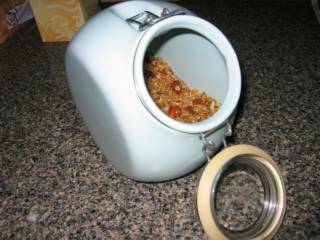 By the way, the regular granola without raisins tastes incomplete. 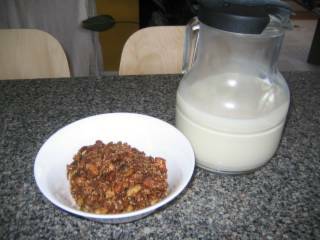 In fact, halfway through my breakfast of raisin-free granola, I had to go to the kitchen and add a handful of raisins myself to make it palatable. 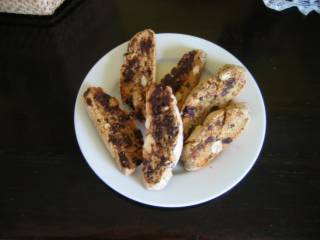 And on to the Breakfast Biscotti. These are so easy to make, and fun too. I made them for the first time on Saturday, and have since made two more batches (it’s Wednesday today). I think they’re a good, lower-fat alternative to chocolate chip cookies. And dark chocolate is good for you anyway, as are almonds. I used 70% and 85% cocoa Lindt dark chocolate bars, which I chopped up myself, because I didn’t have dark chocolate chips. 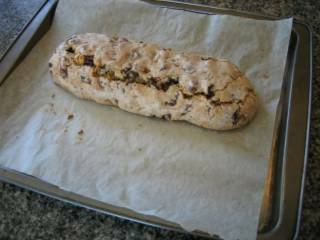 You form the dough into a log (I do two logs because it’s easier to make them the right size that way), bake it, then slice it and let the slices dry out in the oven to become biscotti. They can be hard to slice into shape without a very sharp knife, so I think it’s a good idea to reduce the amount of chocolate. And following Allan’s advice, I sprinkled the pre-baked biscuits with water and castor sugar for a delicious crunch. They’re highly addictive, very yummy, and perfect with coffee for a light breakfast or as a snack any time of the day. I love the way they looked when stacked up in a jar, just like a game of Jenga. 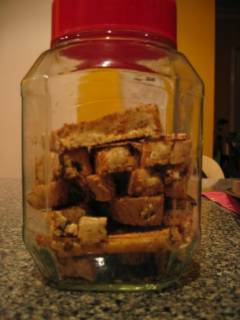 Breakfast Biscotti in a jar. 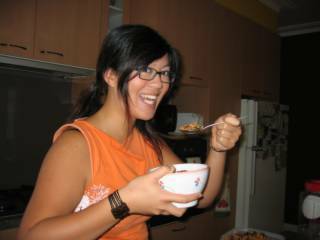 Jess T’s mum: upon eating biscotti Mmmm…. Mmm… MMMMM! Give Jess the recipe. Now!! Daniel: upon eating biscotti Absolutely brilliant. The other recipes in the breakfast chapter that I want to try are the Banana Buttermilk Pancakes, the Cheesecakelets (like pikelets), Granola Muffins (with my homemade granola, of course), the Banana Breakfast Ring and the Breakfast Biscuits. Ooh and the Ricotta Hotcakes from Forever Summer. With such delicious breakfasts, it's easy to see why breakfast is the most important meal of the day.